Wasfi Tal (Arabic: وصفي التل‎; 19 January 1919 – 28 November 1971) was a Jordanian politician, statesman and general. He served as Prime Minister of Jordan for three separate terms, 1962–63, 1965–67 and 1970 until his assassination in 1971. Tal was born in Irbid to prominent poet Mustafa Wahbi Tal. He received his education in Al-Salt, later continuing his education at the American University of Beirut in 1941. He then joined the British Army in Mandatory Palestine after being trained in a British-run military academy, and joined the irregular Arab Liberation Army to fight against Israel during the 1948 Arab–Israeli War. Following the war, he served various positions in the Jordanian government, rising to higher positions after his abilities captured King Hussein's attention. His first tenure as Prime Minister in 1962 was short-lived, he resigned in 1963 over widespread criticism of his perceived pro-Western views. He was appointed Prime Minister again in 1965, which saw an improved climate of economic activity, but resigned just before the onset of the Six Day War in 1967. He was appointed again as Prime Minister in 1970 during Black September, the conflict which saw Palestine Liberation Organization fighters (fedayeen) expelled from Jordan. Earning the ire of PLO leaders for his role in the conflict, he was assassinated by the Black September group outside a Cairo hotel hosting an Arab League conference. Tal was reportedly extremely loyal to King Hussein, and was popular within Jordan for his success in expelling the fedayeen. Meanwhile, he was widely denounced by Arabs who had supported the fedayeen. Egyptian President Anwar Sadat had also despised Tal. Tal was the third senior Jordanian political figure assassinated between 1951 and 1971; the first two being King Abdullah I and Prime Minister Hazza Majali. Tal’s assassins were found innocent and released on bail by an Egyptian court. Tal was born in Irbid, a city in northern Jordan, in 1919. He served as a captain in the British Army during World War II. He also took part in the 1948 Palestine war, fighting for the Arab armies. He became a major in the Jordanian army shortly before graduating from American University of Beirut. After graduation, he began to work in the Jordanian civil service. Next, he served as chief press officer. Later he was named as the Jordanian ambassador, and he served as an ambassador in Germany, Iran and Iraq. Tal was married to Sadia Jabri, who had been former wife of the Palestinian leader of the 1940s, Musa Alami. They had no children. On 28 November 1971, four gunmen assassinated Tal in the lobby of the Sheraton Cairo Hotel in Egypt while he was attending an Arab League summit in the city. Among other acts, Black September accused Tal of personally torturing and executing Abu Ali Iyad, a Fatah field commander whose partisans formed the backbone of the Black September organization. Historian Patrick Seale claims that one of the assassins, Munshir al-Khalifa, was one of Abu Ali Iyad's soldiers who sought to avenge his commander's death. As Tal lay dying, "one of the assassins knelt and lapped with his tongue the blood flowing across the marble floor." Tal was the first victim of the newly formed Black September Organization, a more militant offshoot of the Palestinian militant organization Fatah. His assassins were released on low bail and allowed to leave Egypt. Yasser Arafat, Fatah's leader and chairman of the Palestine Liberation Organization, claimed responsibility for the killing. Tal's body was flown back to Amman on 28 November 1971. He was buried in the royal cemetery after the prayers in the Royal Mosque in Amman on 29 November. ^ "Hussein's Premier". The New York Times. 7 April 1971. Retrieved 28 November 2018. ^ Heads of States and Governments Since 1945. Retrieved 29 November 2018. ^ "Slain Jordanian Angered Many Arabs". The New York Times. 29 November 1971. Retrieved 29 November 2018. ^ Grose, Peter (29 November 1971). "Bloody reprisals feared for slaying of premier". Eugene Register-Guard. Ramallah. Retrieved 15 December 2012. ^ a b c d e "Wasfi Tel was bitter enemy of guerrillas". Gadsden Times. 29 November 1971. Retrieved 15 December 2012. ^ a b Rubin, Barry M. (1994). Revolution until victory? : the politics and history of the PLO. pp. 37–38. ^ Jessup, John E. (1998). An encyclopedic dictionary of conflict and conflict resolution, 1945–1996. p. 77. ^ a b Amos, 1980, p.222. ^ Bruce Hoffman (December 2001). "All you need is love: How the terrorists stopped terrorism". The Atlantic. ^ Shair, Kamal A. (2006). Out of the Middle East: the emergence of an Arab global business. p. 240. ^ "Avange Rebel's Death". The Deseret News. Caito. UPI. 29 November 1971. Retrieved 15 December 2012. Susser, Asher (1994). 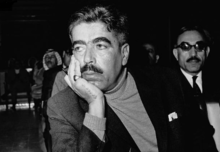 On both banks of the Jordan : a political biography of Wasfi al-Tall. Frank Cass. ISBN 0714645281. This page is based on the Wikipedia article Wasfi Tal; it is used under the Creative Commons Attribution-ShareAlike 3.0 Unported License (CC-BY-SA). You may redistribute it, verbatim or modified, providing that you comply with the terms of the CC-BY-SA.